Since initiating market reforms in 1990 under the administration of President César Gaviria, Colombia’s economy has climbed from a GNI of $38 billion to over $435 billion today , with an expected growth rate of %4. In addition to market reforms, the presidency of Álvaro Uribe (2002-2010) stabilized crippling violence form drug cartels, including the the FARC and the ELN. 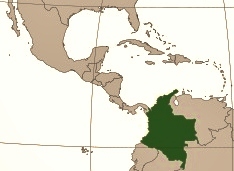 More recently, Colombia has integrated it’s markets further into the world economy, including a capstone bilateral free trade agreement with the United States which is the destination for 36% of the country’s exports. The agreement was passed on October 12, 2011, and went into affect on May 15, 2012. Despite these recent statistical improvements for the economy, Colombia’s ranking on the latest Index of Economic Freedom produced by the Heritage Foundation has slipped since 1995 (the ranking’s earliest data). Largely due to economic reforms put in place under President Gaviria, the country started out 26th worldwide in terms of economic freedom, and has since slipped to 44th worldwide. Chile ranked the highest in Latin America, and Argentina and Venezuela rounded out the bottom of the rankings in Latin America, and nearly the world. Data from World Bank. Last updated: Sep 6, 2012. GDP per capita, current prices. Data from IMF, April 2012 WEO. Last updated: Aug 20, 2012.